This section covers the setup and operation of Arena’s Check-In. You can use Arena Check-In with a touch screen and a traditional kiosk with a keyboard and mouse. 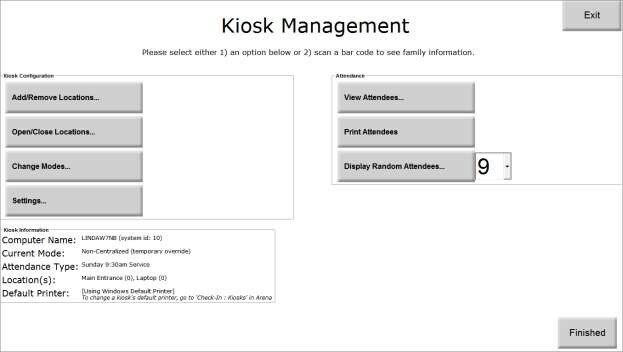 The first time you run this application on the kiosk, set up the Location, Attendance Type Category, and Mode. This is a one-time setup unless you change kiosk DNS in the kiosk settings under Check-In. You can also access via the Check-In URL. 1. From the Check-In menu, click the Check-In option. 2. Click Select All or Specific Locations. These are the Locations as setup in Check-In within Arena. You can change these settings later under Check-In/Kiosks by opening the corresponding kiosk in Arena. 3. Click the Finished button. 4. Select the Check-In Mode. 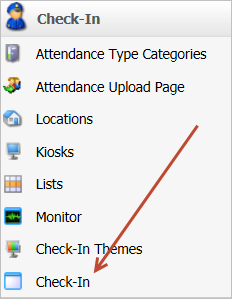 •Centralized – Use this option to enable every Attendance Type tied to the Locations to check in. Use this option if you are using one kiosk for multiple classes. 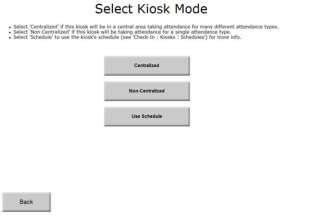 •Non-Centralized – Use this option to select particular Attendance Type to use with this kiosk. Use this option if you are using a kiosk for each class. Arena prompts you to select the Attendance Type this kiosk uses. •Use Schedule – Use this option to narrow check-in even further. 5. From this screen, attendees can scan a Check-In card for themselves or their family, or they can use the Manual Check-In option to use the Phone Lookup. Once you run the Check-In application members can check into the available Attendance Types. Be sure to review Check-In Application Settings such as if you want to Allow Family Members to be Pre-selected or Must Manually Choose Family Members (this determines whether to scan a Member's entire family or not. ), and if Classes Are Preselected. If you are using Arena Check-In and would like to allow non-family members to Check-In one another, your Administrator can create a Relationship containing the phrase "can checkin" (case insensitive, no quotes) that permits this action. To close the Check-In application press “ATL” + “F4” key. The first time a user runs an application, the user has the option to install a desktop shortcut. Thereafter, the user can launch the application from the desktop shortcut or from Arena. When a member scans a member card or checks in, Arena displays a list of records associated with the specific member card or phone number whom are eligible to Check-In. Arena displays family members and those records with a “can checkin” Relationship Type. Arena displays the “best fit” class(es) for this person, based on what classes are currently open, what classes allow check in at this time, the person’s age, and gender. You can establish these parameters in the Attendance Types Categories and Attendance Types. 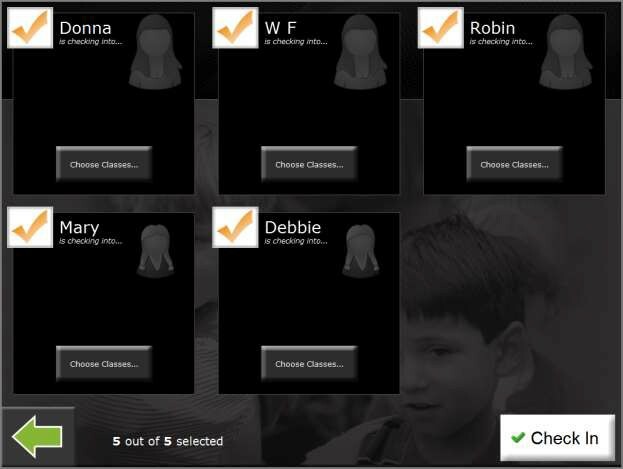 Once John selects his class, he then presses the white “Check In” box to check into the class. A receipt prints for him, if setup to do so. Members only need to click Check-In one time. Clicking more than once could results in errors. John confirms the class is correct and then returns to the family list, where he presses Jimmy’s name to Check In. Notice Arena automatically places John and Jimmy into different classes. 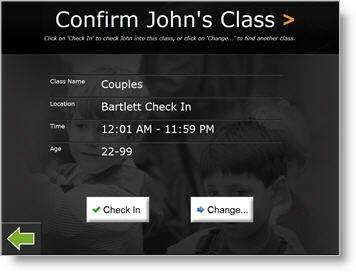 When John pressed his own name, the class selection page came up with his two class choices Couples and All Attendees. For Jimmy, who is 5 years old, the Kindergarten class comes up, as it is set to allow ages 5-6. If John accidentally presses the wrong person, he can press the Arrow to go back. 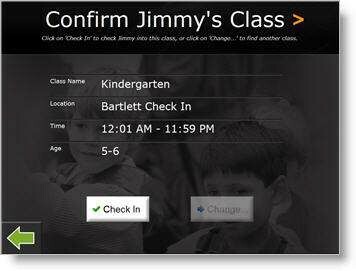 Since he wants to check in Jimmy, John now presses Check In to check Jimmy into the Kindergarten class. A receipt prints out, and Check-In displays the family list. In this scenario, John can check into All Attendees, instead of Couples. John would see a new Confirmation page, and can now complete the check in process. Notice that John and Jimmy are grayed out and “(checked in)” displays next to their names. If John is done checking people in, he presses Finished or he can check in someone else. 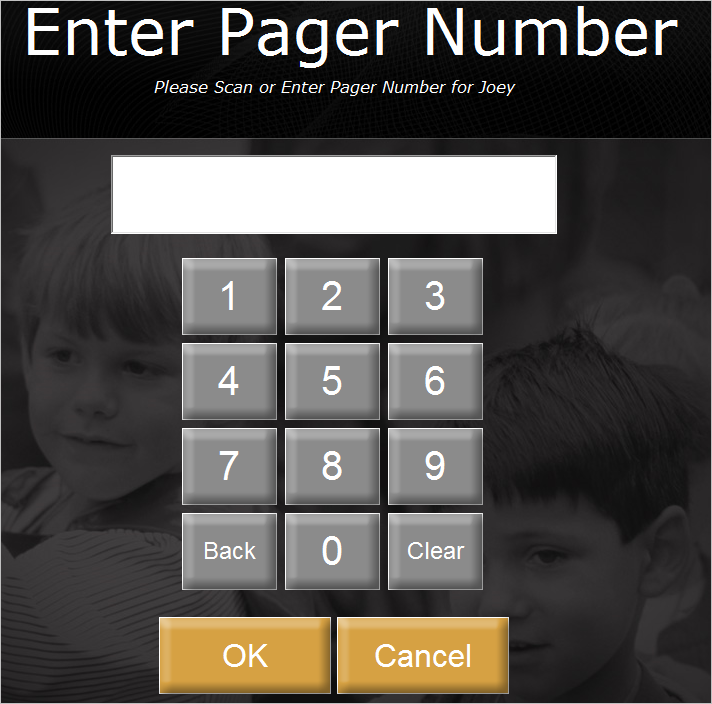 If pager number was selected for the Attendance Type, enter a numerical pager number at the time of check-in. If not using pagers, consider entering the family ID, last digits of the phone number or other unique numerical values. Using Non-Centralized mode only allows you to check into one Attendance Type at this kiosk. 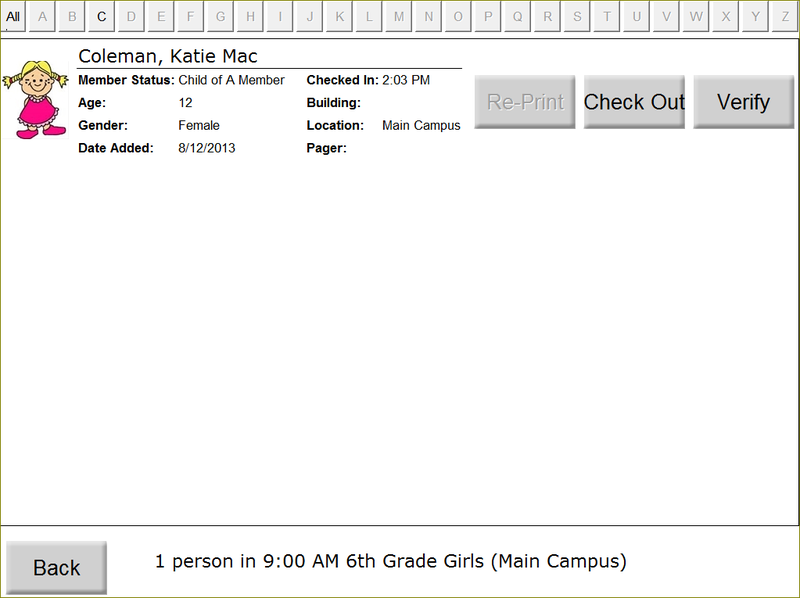 The Main page looks similar, but the bottom left corner shows the Attendance Type, the Location, and the current number of people checked into the Class. 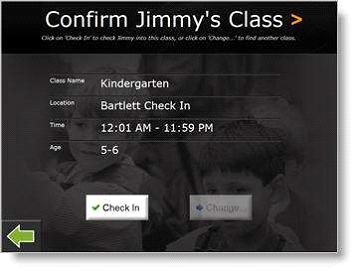 In this example, the kiosk is setup for Kindergarten, which is in the Bartlett Check-In Location. In the Doe family, only Jimmy is eligible for the Kindergarten Attendance Type. When John scans his barcode or looks up his family using the Manual Lookup, Jimmy automatically checks in. 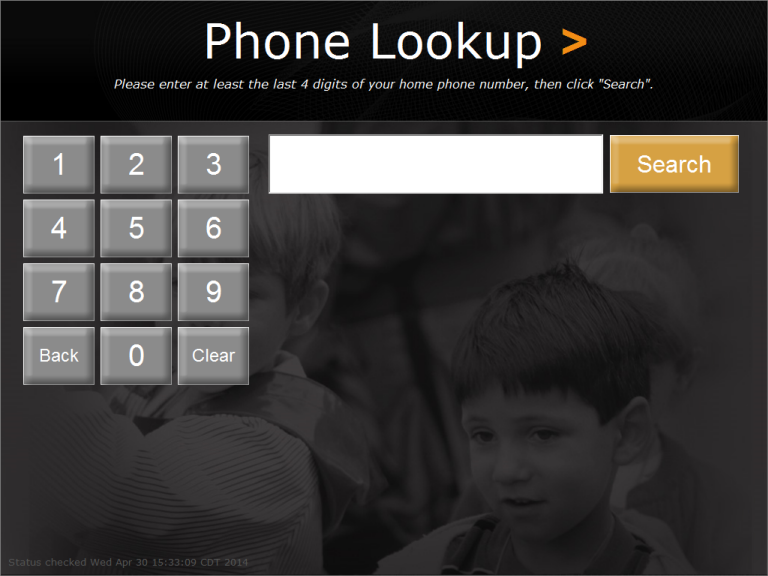 Members can enter any phone number applied to the individual record. It is generally recommended to use at least Main/Home and Cell. Main/Home displays all records in the family whereas the cell phone number displays the individual to which the phone number exists on the record. 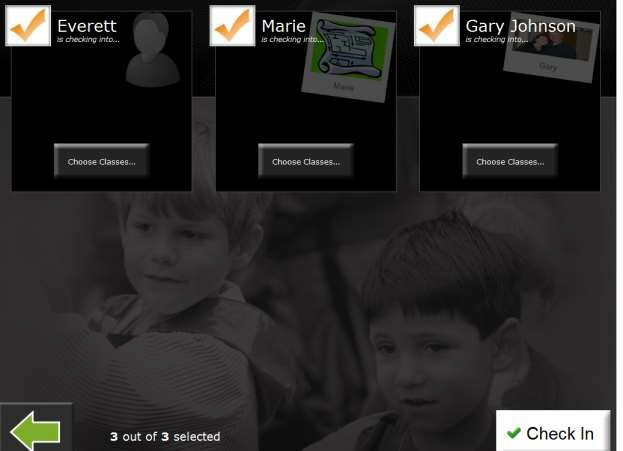 If John has multiple family members who are eligible for a Type, a page displays from which he can choose all or only those family members to check in, as shown on the following page. John would click Finished when he has chosen the correct family member(s). This checks them in and prints out the receipt(s). 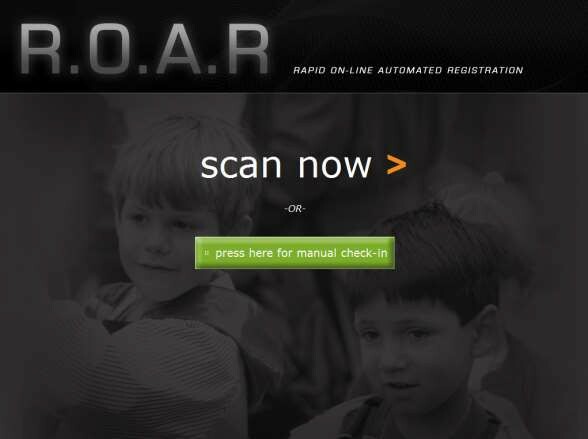 Users with permission can access the Check-In (Kiosk Management) management page. To access the Check-In management page enter the Check-In Management URL from a browser or press “Ctrl” + “M” on the keyboard and enter the required login and password. This requires domain access. 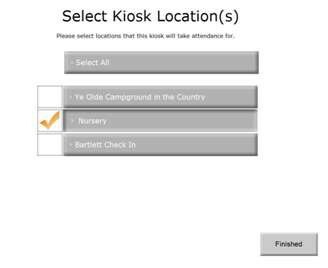 •Add/Remove Locations – Use this button to change locations and associated attendance types for this kiosk. 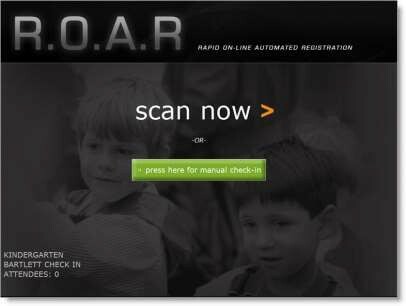 •Open/Close Locations – Use this button to manually close or open a location using this kiosk. •Change Modes – Use this button to change the mode of this kiosk to Centralized or Non-Centralized. You can use Kiosk Schedule to reset back to the Schedule Settings, removing any temporary changes made to the Kiosk. •View Attendees – Use this button to view and verify attendees, reprint labels, and to check out attendees. •Print Attendees – Use this button to print a list of all people checked in. This feature is available for non-centralized kiosks. 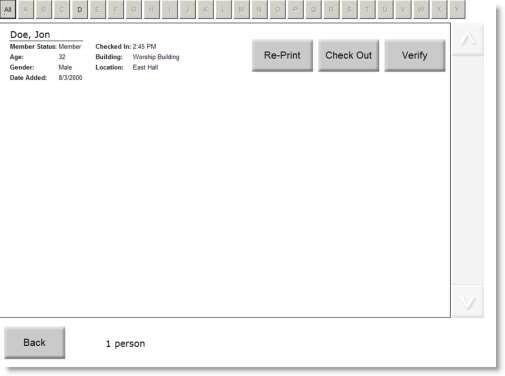 •Display Random Attendees – Use this button to display a random list of people checked in. Select the number to the right to select how many people to display. This feature is available for non-centralized kiosks. •Exit – Click this button to close the Check-In application. •Finished – Click this button to return the Check-In home screen. Arena offers three options for check out. If using check-in labels with a bar code, scan the barcode. Arena automatically checks the person out and time stamps it. You should see the barcode in the dataset of the label if it is not on your current setup. If using vein scanning, scan the finger at time of check out. Arena automatically checks the person out and time stamps it. 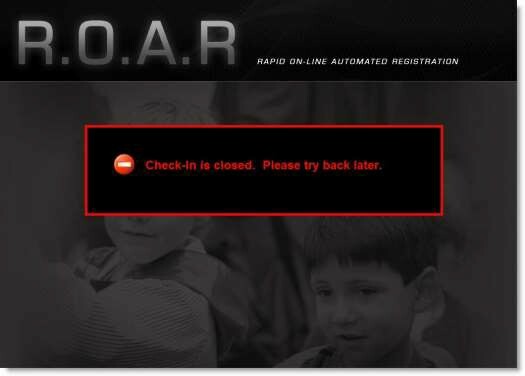 Users with permission to access the Check-In Management page, as shown below, can check out members. Prior to check out, users can also select Verify to display the records whom can check out the individual/child. By default, immediate family displays and those records indicated with the Can CheckIn Relationship Type. If this kiosk has no open Location, the below screen displays. If you scan a barcode of someone while in the Management Page, it displays a list of the family members so that you can check any/all out. Click the Verify button for a list of people who are authorized to check out the child, or print a receipt for each person. Click the Back button to exit this page. Click the Back button to exit the management screen and return to the kiosk Main Page. On the Check-In screen, individuals can check other people who are either a family member, share the same phone number and/or have of have the “can checkin” Relationship Type. Arena identifies those individuals by displaying the full name on the check-in screen.